Disgusting deep fried bar food doesn’t really have to be disgusting, or eaten at a bar. In fact, it doesn’t really need to be deep fried, either. 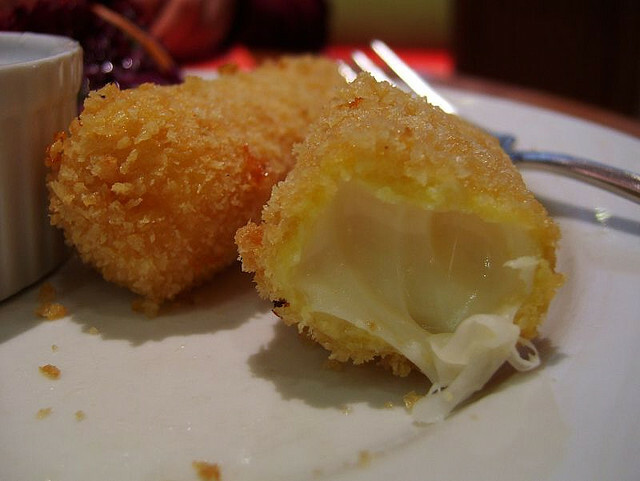 This recipe will have you cooking homemade mozzarella sticks without any fancy equipment. Start out with a pound of mozzarella cheese, a couple of eggs, and a bunch of bread crumbs. Cut your cheese into strips about two inches long and about half an inch wide on both sides. Keeping them fairly uniform isn’t really important, but it helps make them look fantastic in a pile. Beat three or four eggs in a bowl. Dip your cheese sticks into the eggs, then into the bread crumbs, and again into the eggs, and again into the bread crumbs. Really, you should do this at least twice but a few extra times just adds additional layers of breading. Now put them in the freezer for at least ten minutes. Once frozen, the ideal way to cook your mozzarella sticks is in light vegetable oil, either in a deep fryer or a cast iron frying pan. But you can also cook them in the oven or even on a regular frying pan with a thin layer of oil. Dip in homemade pasta sauce or a great barbecue sauce. Or ranch dressing, or really, anything. Dip them in stuff.